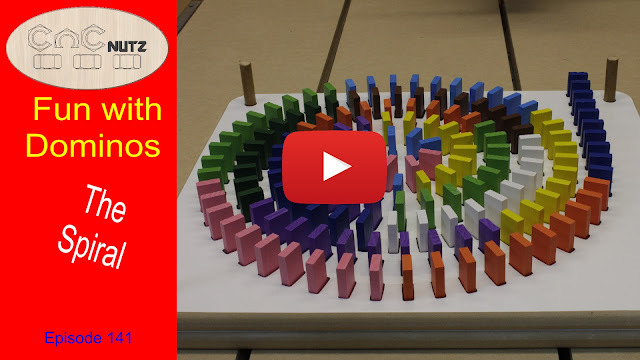 Carrying on from last weeks project this domino inspired project creates a simple way for young children to setup complex domino shapes without the fear of them falling down untio they are ready fo it to happen. The beauty of this project is it forms a stand alone toy that the child can use in a confined area such as a small table. For this project I had already made a prototype that has been in use for several weeks and has worked fine. The decision to use melamine proved to cause an unexpected problem that did not occur to me until the first test spiral. Melamine has a very shiny and slippery surfacer which allows the dominos to twist when struck by the previous domino. this knocks them out of alignment and causes the last of the dominos the remain upright. In extremes more then half of the dominos may remain standing. Since the prototype was made of plain MDF this was not an issue. Another problem of my own making was to increase the spacing between the dominos to ensure I got the 100 holes I wanted in the spiral. Unfortunately this increased spacing caused the dominoes to miss the next one in the sequence especially as they get closer to the center and the slippery base only makes things worst. To solve the slipery base issue I sanded the base usind 150 grit sand paper which seems to have eliminated the twisting of the dominoes as they fall but the spacing issue can only be solved by redesigning the spiral. The new design used a fixed spacing of no more than half the domino height. This seems to ensure a good overlap without them being too close. This ensures that the spiral termplate is 6mm (1/4") above the domino height before it can rotate. This makes it difficult to knock down the doninoes while removing the template unles the user is very rough or careless. If you would like to make your own I have provided the following plans.